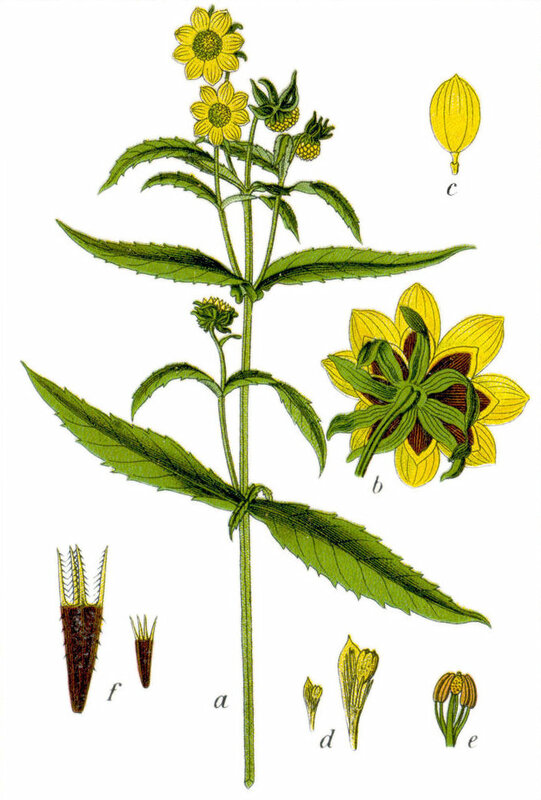 In late summer and early fall, you might come across this showy little sunflower growing in wet places. Reaching just 3 feet in height, Nodding Bur Marigold has much smaller flowers than your average sunflower–its flower heads are only about 1 to 2 inches across! Like most miniature things, this petite version of a sunflower is pretty darn cute. Bur Marigold is a composite with 6 to 8 yellow ray flowers, each with a tiny notch at the tip. Do you see the notch? The center disk is darker, and brownish-yellow. Sometimes the petals are absent all together. Look closely: there are two sets of bracts behind the flower head. The outer bracts are long and dark green; the inner bracts are shorter and paler--almost translucent. The flower head nods down as it ages, giving it the common name Nodding Bur Marigold. The leaves of this plant are opposite, long and narrow (about 4-6 inches long), toothed, and hairless. They is no petiole; instead, the leaves clasp the stem and appear to actually combine with each other around the stem. Stems are usually hairless. Click on the photo to the right to see more detail. Nodding Bur Marigold is commonly found growing in wet places. The plants below were photographed at the edge of a pond in Blacksburg in mid-September. Sometimes this plant is called Nodding Beggarticks or Sticktights. That’s because the seeds are flat and barbed, so they stick real well to your clothes. Yikes! See the extra set of bracts? Is this the flower that I see along the Interstate 295? If it is, I would like to grow them at my home in Hanover County. I can’t say, since I don’t travel that road. But I agree, this looks like a good one to grow at home!